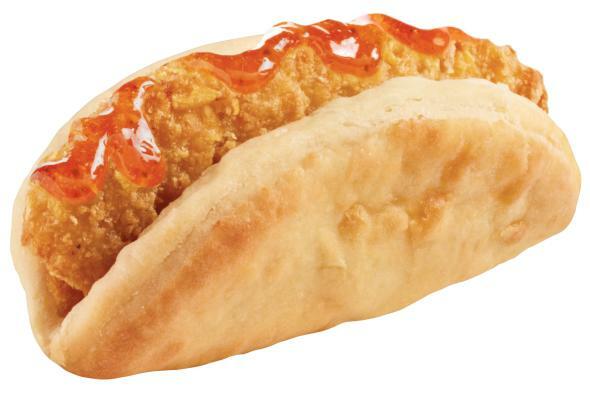 And just when I thought the height of ridiculousness had been reached with the Quesarito and the Frito-stuffed Chicken Enchilada Melt, comes the Biscuit Taco, a breakfast concept being tested in -where else?- California. But the Biscuit Taco is not alone in its ridiculousness, and is only the latest addition to the I Don’t Wanna Taco ‘Bout it Wall of Shame, which you are free to click -of course- at your own risk. This entry was posted in Food, Guacala, Hispanic Heritage Month, Marketing & Advertising and tagged breakfast taco, breakfat, ridiculous food, Taco Bell, tacos. Bookmark the permalink. It’s hard to tell if that’s Processed American Potato Stuff inside, or Processed American Chicken Stuff — but clearly either would go great with that drizzle of raspberry jam!